Rug was nice and thick. Unfortunately it was too dark for my space. 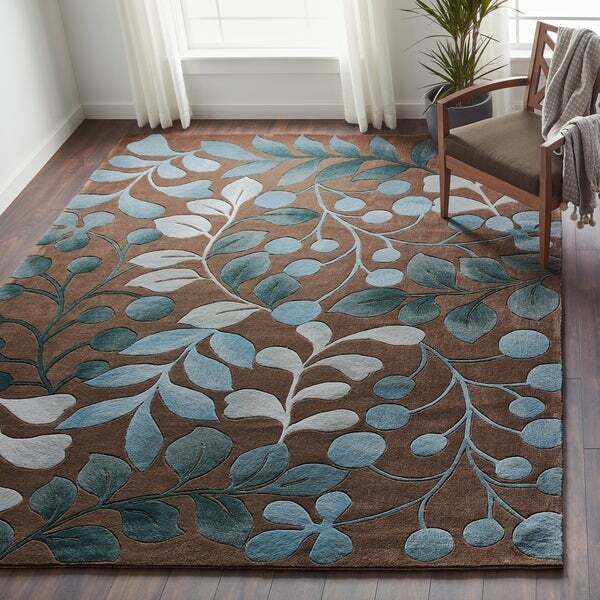 Nourison Hand-tufted Contours Grey Rug - 3'6" x 5'6"
Add a sophisticated splash of color and instant allure to any roomwith this overscale leaf and branch design. Highlighted ineffervescent hues of sky, peacock, teal and pastel blue on amagnificent mocha background, this transitional handcrafted rugfeatures finely hand-carved details for a thrilling tone andtexture. 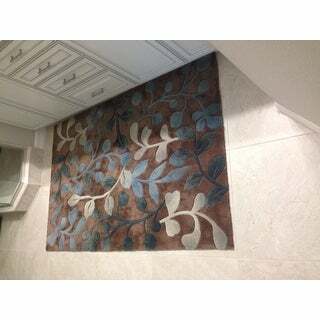 This plush area rug works well with any furniture style.The size is perfect for an entryway or kitchen, and is great as afocal point at the foot of a bed or in front of your sofa. Thesubtle colors in the rug are understated and warm and will matchnearly any color scheme. The rug is made from stain-resistantpolyester. Ordered this to use in my kitchen, & it fits, & works perfectly! Such a well made rug. It has the making of an expensive European rug with the banding and material of artisans crafting. Such an extremely well made rug.The colors compliment any decor from warm and cozy to bright and relaxing. The cool colors and shades of blues and grays allow brightness and life into your home. The softness of the tufting is wonderful to sink your toes in. I will and have recommended this brand and rug to fit any decor to all my friends. 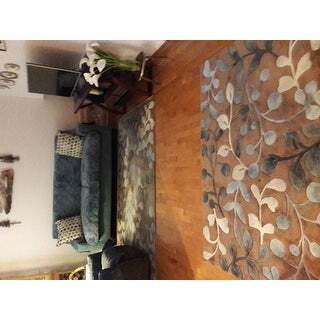 I loved this rug when I first saw it, but was hesitant to buy because I feared that it wouldn't go with my blue leather couch. Several reviewers described it as teal, not blue, which wouldn't work for me. Finally, to test the colors, I decided to purchase the smallest size and, if it didn't work, I'd place it in the foyer. As it turned out, it goes beautifully with my couch, It's a soft light blue, not teal,against a light brown background, with off white/light gray accents. It looks rich and is well made. Now I'll order the larger size. I'm very pleased with this product! 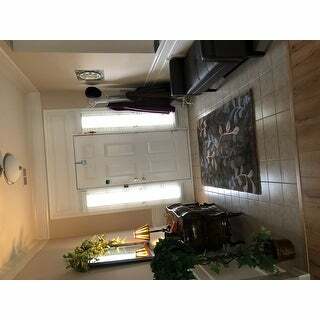 I purchased two rugs for my entrance way, one for the front door and another for the entrance into the family room. The rugs are nice and thick, they feel like they have padding under them. They are of excellent quality, I have vacumed them multiple times with little shedding. However, smaller than I anticipated and the background color was different than I expected. The background color is more brown/olive green. Overall, I will adjust to the not so perfect purchase. I would recommend them if you do not need a perfect match to your decor and remember they may be about 2 inches smaller in both directions. The colors are as pictured but with more depth and beautiful chocolate brown is so rich while the silver through teal leaves and berries sparkle. I purchased this rug for my new kitchen and it is perfect. It matches my new living area rug in colors but not pattern and both look well together. I wish though that I had purchased this rug in the larger size for the living area as it is so soft without a pad underneath. The pad comes tomorrow so standing at the kitchen counter should be like heaven. I also purchased the same rug in the 5'x7'6" size. The rugs are of high quality. Beutiful colors. Very happy with my rugs. Beautiful! Just what I was looking for. I read in another review that the background was more brown than grey, so I was a bit hesitant to order, but it actually works wonderfully in the room I put it in. 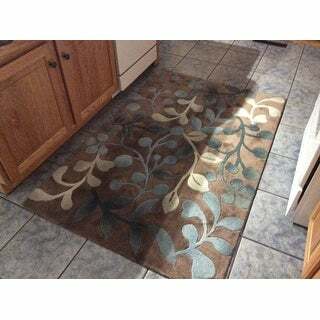 I originally found this rug at another retailer for nearly triple the price, so I was thrilled to find such a great price on Overstock! Nourisonhand-tufted Contours botonical mocha rug. I love this rug. Colors are beautiful. The rug is thick and plush. I am very pleased with Overstock. Really, really like the look, style, and feel of this rug. I bought two different sizes and goes great with the blue curtain color and gray furniture. Would definitely recommend this particular brand and style. Color true to pictures. 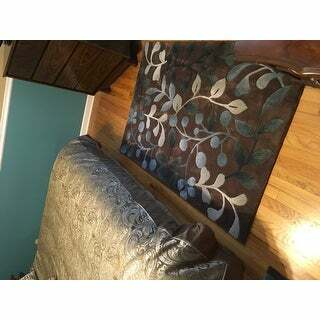 This rug is of high quality, I love the colors, some green, teal, gray/ silver on brown. It has a great backing on it, will not scratch the wood floors, but needs a pad just to keep it in place. It is thick and heavy which to me indicates quality. I love mine. I just got it today and I'm not sure where I will use it. I have 3 areas where I could use it. Thanks OverStock for good items at good prices. We have this in our foyer, so it is the first thing guests see when they walk in our door. We have received so many compliments on it. 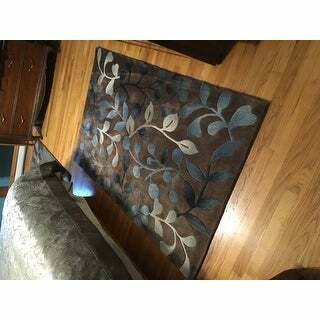 Wonderfully constructed; beautiful rug; is holding up perfectly! well made rug..the brown looks more like a gold color though.. Put it in the kitchen, and it's perfect. Cushions the feet while standing in a stationery position while cooking, and looks amazing. Work the price. I got this for a friend housewarming party blue is her favorite color and I wanted something chick and this was perfect for the decor of her bedroom. Bought this to go with existing 5 x 7 rug that I already own. Love these rugs, they look so rich and are so plush. Do not hesitate to purchase these rugs! I bought three of these rugs for my bedroom and they are plush and beautiful. I'm so happy with my purchase and all my friends love them as well. I would definitely recommend this purchase. Loved this rug so much I ordered it again. Only negative was that after 6 years it faded so much I had to replace. Honestly though, using it at my front door, with lots of people and dirty dog traffic and it continued to look great! Nice and thick. Love the colors. Looks great in my entry way. Exactly what I wanted. This is perfect for the area I needed it for. Very plush. The colors are perfect. Rug is awesome. Beautiful colors. Great price. Good quality. The rugs came within two days they are beautiful and great quality. Very pleased. This area rug was perfect for my foyer. It tied everything together very well made and colors are very rich. Many complements from everyone that walks into my foyer. "What type of backing does this rug have?" "Is it more of a denim or teal blue. Thank you." "In one picture the blue looks smoky and in another it looks like bright sky blue. Which is it?" This is a lovely rug. It is three shades of blue: a sky blue, a smoky blue and a deeper blue. Hope this is helpful! "Does this rug come in a runner?" Yes it will be available on September 12, 2017. "Is this rug stain resistant?" It is stain, soil and fade resistant. "how is this item packaged for shipping?" The rug comes tightly rolled and encased in plastic. It is a beautiful rug and very heavy. It is rolled up and wrapped in heavy duty plastic..heavy rug..
As plaub said, rolled and packaged in plastic. Only thing I can add is that the plastic is very heavy and protective. It will take 2-3 days for the rug edges to completely flatten out. The rug is very heavy and thick but not the kind of thick your feet sink into, it's more dense. "Is a 10 × 12 or 8 x 10 available? Love this rug?"